Heat oven to 375°F. Spray 9-inch round cake pan with cooking spray. 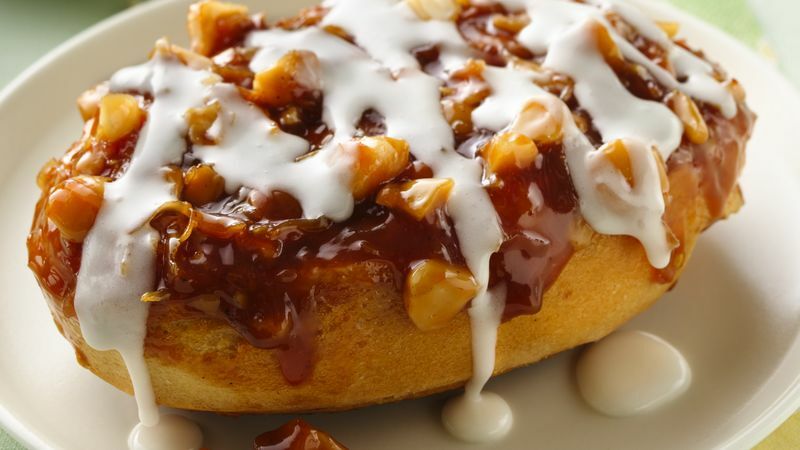 Spread caramel topping evenly over bottom of pan. Sprinkle with nuts and coconut. Separate dough into 8 rolls; set icing aside. Place rolls on top of mixture in pan. Bake 26 to 30 minutes or until deep golden brown. Turn pan upside down onto heatproof serving plate. Cool 5 minutes. Remove cover from icing; microwave on Medium (50%) 5 to 10 seconds or until thin enough to drizzle. Drizzle over warm rolls. Serve warm. Serve with sliced fresh pineapple on the side and pineapple-orange juice for a breakfast that's refreshingly tropical and simple.